HMI System's standard keypad offerings allow a designer to build semi-custom systems for a minimal cost. Our standard keypads are made from high quality silicone that can be laser etched with specified button legends, text or company logo. The 482CRM series is a programmable multi-color LED rocker switch module, designed to operate within a Controller Area Network (CAN) j1939. This innovative new product incorporates independently controlled LED’s, allowing custom-configured color selection on a per LED basis. 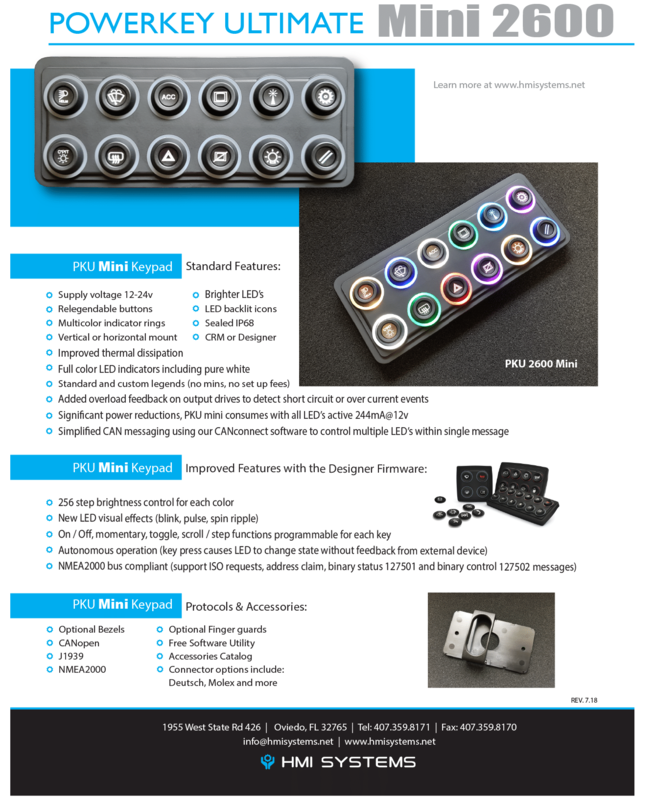 Via configuration utility software, each LED is capable of being configured to produce up to 8 unique colors without the need for special ordering or assembly.The software is integrated with HMI CANconnect software suite. The 516CANDI (CAN Display Interface) is a CAN based 2.4" color TFT LCD with touchscreen. Screens are designed using an intuitive GUI builder that leverages simple HTML and scripting support for implementing dynamic customer interfaces. The software is integrated with HMI CANcreate software suite. The 550MDI (Media Display Interface) is a CAN based 4.3” 262K color 480 x 272 TFT High Brightness LCD with touchscreen. The 550MDI supports dual independent CAN transceivers and a LIN transceiver for providing a gateway between multiple in-vehicle networks. Screens are designed using an intuitive GUI builder (CAN Create) capable of implementing dynamic customer interfaces. The 550MDI is housed in a custom molded enclosure that allows for a minimum dash profile of 0.75 inches and various mounting options. The housing contains two molded in Deutsch DT style polarized connectors for enhanced sealing and reliability. The 700MDI includes up to 4 GB of available mem- ory stored on an internal micro SD card. Using the USB port all data stored on the card can be accessed through a PC as a mass storage device. Since all program application data, GUI compo- nents, and data logs are contained on the micro SD card this allows immediate field upgrades of critical software components simply by transfer- ring new files to the card. The available memory and file OS can support thousands of pages of information and brand new to the 700MDI is the ability to playback audio events using the internal 1.5W speaker.